The cottony, comfortable, adjustable, extra bed in a minute. The Deluxe Aerobed has all the quality and convenience of AeroBed with a comfortable breathable cotton finish. The Deluxe AeroBed is covered in stain-protected 100% cotton to resist dirt and stains. Like the AeroBed, it is constructed of heavy-duty vinyl with electronically welded seams for durability. 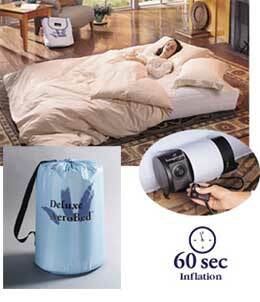 It inflates in less than a minute, deflates in 15 seconds and rolls up for easy storage in its own matching cotton duffel bag. It also fits standard size sheets for easy setup and extra convenience. For the ultimate in comfort, a deluxe washable quilted mattress cover is also available. Deluxe AeroBed has an advanced coil system that provides luxurious support and helps prevent bowing, sagging and swaying. And, Deluxe AeroBed features the exclusive One-Touch comfort control so you can adjust the bed to your desired firmness. With Deluxe AeroBed, you'll look forward to overnight guests. You may even find yourself using it! Get the ultimate in fast, easy, compact comfort. Deluxe AeroBed. The cottony, comfortable, adjustable, extra bed in a minute. Deluxe AeroBed comes complete with bed, built-in pump and One-Touch comfort control and handy carry bag.